In October 2009, Jesse Kurtz-Nicholl sat down with Ana Araujo to discuss the Urban Agriculture and Food Systems class she participated in at Richmond High School in 2008/2009. The class was a pilot program, which gave the students graduation credit and was centered around the creation of a CSA (Community Supported Agriculture) and direct sale of produce from a middle school farm and the school garden at Richmond High. 10 families received a bi-weekly box of produce for $5, which was planted, tended and grown completely by Richmond High students. In addition to the garden, the students learned about the American food system, their local food shed and global issues surrounding food. The students joined working groups in their chosen area of focus to delve deeper into the project. Students presented their work to the City Council of Richmond as their final project. What do you think were the best parts of the Urban Ag Class in general? Q: Why. Why do you like that stuff? It seems fun, putting plants, seeing them grow. You did that. You planted that. You saw it grow, you gave it water. You watched it grow. You did something for the community. And like it felt good. Q: If we were going to run this program again, what do you think needs to be improved. Was there anything you didn’t like or needs to be changed? If we had more land. Land to grow and plant, that’d be great. Because we were really limited in the boxes we made, only 10 every two weeks. So that was really limited. If we had more, we could expand on that. Q: If you could have anything you wanted, what would you ask for? I’d ask for more. A piece of land, seeds and tools. Q: Would you want to give a box to every family in the school? Yeah, if we can, if it’s possible with the food we have. Q: Would they eat it? I hope. I mean, if they pay for it, they would eat it. We should keep the process of having them pay at least 5$ for their food. Because if they pay for it, they would value the food more. Otherwise, they’re being given it. Q: Do you think, you’ve been personally affected by the program? Has it changed you in any way? It’s changed me in a way. But I hope I change more, if I keep being in the program. Because now I just eat what’s at home. I used to be like, I don’t want to eat that and I would just go and eat at McDonalds or something. But now after you told us about how our food is processed, and I’m like, that’s kind of gross. I don’t want my food going through a bunch of stuff. I’ve encouraged my mom to buy more fresh meat, more organic meat, but sometimes its not possbile, because its expensive. But she tries to do it when she can. So, I’m like, my cow that I’m eating is being fed hormones. That’s kind of gross. Q: You eat more at home now? Yeah, I really do. I drink less soda, I more like water. I make my mom make agua frescas. It’s more better. Q: Has your family changed anything about the way they eat? After being in the program has anything changed about your family? Yeah, it has. Because I’ve told my dad and my brother and my mom, look, let’s do this, let’s eat at home. It’s cheaper, its easier, we could always eat the leftovers and my dad agrees to it. My mom also agrees to it, and my brother is just like okay whatever, food is food. In a way it has. Q: If you had to say that you learned 3 things in the program, what would they be? Hmmm, I learned how to eat better. I learned how to plant fruits and vegetables and stuff, and that’s like a really good skill. And also, I opened my eyes to how the food system works, now, its like they’re feeding us garbage in a way. Q: Since being in the program, have you ever taken any of the information and used it directly in some way? Well, I’ve told my mom we should have a little garden. We planted tomatoes in our backyard and they grew and we used them. And my aunt she planted squashes and little red cherry tomatoes and chilis in her backyard and we used those. Q: Did she do that before? Kind of, but I told her, look this is good and she started doing more of it, planting more plants. Q: How do you feel about your ability to change your community and your family? Your power? I feel like I could, if I had the support from them, from people. Then I could be able to educate people on the way that food is made and they way we should eat better. Because diabetes and obesity is a big thing now. Q: How do you know about that? Does anyone in your family have it? My great grandpa died because of diabetes, my grandma has diabetes on my mom’s side. And my grandpa, just recently died on my dad’s side had diabetes. So, it’s on both sides, so I’m really worried about that. I got myself checked over the summer. I don’t have diabetes, but I’m watching out, what I eat and stuff, because it could happen to me. Q: Do you think teenagers in Richmond are healthy? There are some. But there are others. There’s not that many good choices, both parents work a lot. And then like, fast food is good, it’s kind of addicting in a way. So I would say no. But, generalizing, I would say any teenager is not healthy in any way. Because one, its very easy for them to go buy fast food. And two, they don’t care. They haven’t been told about this stuff. Grownups, they read it in the newspaper, they educate themselves, but the younger generation, they don’t really pay attention. Like me, I didn’t really pay attention, until I got into this class. Great post! Love the Q&A style story. Great pictures and great article, Jesse and Ana. The Richmond High School Urban Ag and Food System class was sponsored by Urban Tilth. If you liked this article and like the idea of high school students taking the lead in creating healthier local food systems, I encourage you to go to http://www.urbantilth.org and make a donation to the 2 Farms in 2 Days event. The last weekend of February, we’ll be putting in 8,000 square foot market gardens at Richmond and Kennedy High Schools in Richmond, CA. These market gardens will become the main production sites of the Urban Agriculture Institutes (2nd generation of the Urban Ag and Food System classes). You can help give high school students in Richmond the capacity to grow more than 15,000 pounds of organic produce for their community! Please spread the word. Thanks for the great story! It warms my heart and gives me just that bit more hope to know that these young folks have been enriched by growing their own food and learning more about our food system and the inherent problems with it. Yes, I believe they really will have a positive impact on our community! 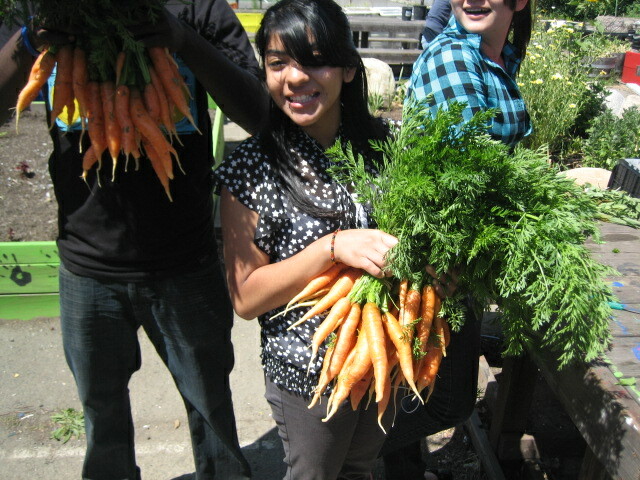 Koodos to Richmond High for being a leader in Urban Ag education! You have come a long way in a few short years. You have to be riding tall this holiday. Wish I could be there with you in Feb. The Virgin Island Sustainable Farming Institute calls me for two months where I will focus on Agro Forestry and Agro Education. One of three Gaia University centers in the world. I was involved in Urban Agriculture two years ago. Now, i am a current student once again. This class has thaught me a lot about having a healthy lifestyle.